Edward Okuń was a painter, draughtsman, and illustrator, representative of the Symbolist movement in the art of the Młoda Polska period. He was born in Wólka Zerzeńska, and he died in 1945 in Skierniewice. He began his artistic education between 1890 and 1891 with Wojciech Gerson's drawing class in Warsaw. In the years 1891-1893 he was attended the School of Fine Arts in Kraków, and learned in the studios of Ignacy Jabłoński, Władysław Łuszczkiewicz, Florian Cynk, and Józef Unierzyski. In 1893 he continued his studies in Munich in the private schools of Stanisław Grocholski and Anton Ažbé. In 1894 he left for Paris where he studied at the Académie Julian in the studios of B. Constant, R. Collin and J.-P. Laurens. In 1897 he returned to Munich to improve his painting skills at S. Hollósy’s school, and he also lived in Hungary, where Hollósy founded an artists’ colony. In 1898 he settled in Italy, which became his artistic homeland for over twenty years; He lived in Rome, travelled to Anticoli Corrado, Sorrento, Amalfi and Capri, and visited Venice, Padua, Ravenna, Florence, and Siena. He participated in the life of the Polish artists' colony in Rome. Between 1901 and 1907 he worked as an illustrator with the elite Warsaw-based artistic and literary magazine Chimera. Starting in 1906, he painted drawings for the Munich magazine Jugend. He also created illustrations for books, including Kasprowicz’s Miłość (Love, Lviv, 1902), Leopold Staff’s Mistrz Twardowski: Pięć Śpiewów o Czynie (Master Twardowski: Five Songs about the Deed, Lviv, 1902) and Stefan Żeromski's Duma o Hetmanie / Elegy for a Hetman (Warsaw, 1909). From 1908 Okuń belonged to the Odłam (Fraction) group. In 1921 he settled again in Warsaw, and travelled to Italy and southern Europe, for example, to Dubrovnik. From 1930 he was a lecturer at the W. Gerson School of Fine Arts in Warsaw. His works were exhibited regularly at the Zachęta Society of Fine Arts (1893, 1895, 1896-1899, 1901, 1903, 1905, 1907-1916, 1922-1926, 1928-1932, 1934-1936, 1937-1938), at the Krywult Salon (1899, 1900, 1902, 1903, 1904-1905), the Kulikowski Salon (1906) and the Abe Gutnajer Salon (1915, 1917). The artist presented his works also at the Society of Friends of Fine Arts in Krakow (1898-1901, 1902, 1904-1905) and Lviv (1901, 1910, 1911/1912, 1922); He has also presented his works in: Łódź (1912, 1922), Poznań (1911), Toruń (1927) and Vilnius (1932). A number of individual exhibitions of Okuń's works took place in the the Zachęta Society of Fine Arts (1902, 1906, 1911, 1913, 1919, 1920, 1924, 1929, 1933, 1939). The artist participated in foreign exhibitions. in Paris (1895, 1921), Berlin (1899), Kiev (1900), Munich (1906-1907, 1928) and Rome (1916-1917). The thematic repertoire of Okuń’s paintings includes landscapes, portraits and fantastic compositions. His paintings were characterised by sophisticated decor and rich painterly substance. In the early phases of his work he used a flexible Art Nouveau line and a rich array of light, qualitatively modulated colours (Pejzaż z Anticoli / Landscape of Anticoli, 1906). In Italian landscapes, he masterfully created the illusion of spatial depth, evocatively rendered luministic effects, perfectly reproduced the trembling of heated air and saturated images with an inner brightness. A pleasant atmosphere was sometimes complemented by staffage introducing the narrative element, while the outlines additively piled up, subjected to the synthesising geometrisation of the buildings in Renaissance towns, connected the viewer’s imagination with the distant past (Autoportret z żoną na tle Anticoli-Corrado / Self-portrait with Wife against Anticoli-Corrado, 1900). Immersed in the sun, Italian architecture took on a symbolic dimension – like the walls of Jerusalem in the painting Judas (1901), the prototype of a vignette that opened the cycle of illustrations to Kasprowicz’s poem Judas (Chimera 1901, 10/11/12); the profile of Judas hidden in the shadow, overwhelmed by his guilt, with the head decorated with a crown made of silver coins, contrasts with the outline of the city on the hill. The views of Roman buildings, fortresses and ruins, sea and rocky landscapes – were recreated by Okuń through harmonising the purples, blues and roses, that complemented the nuances of greens and browns. The colour scheme was suppressed, giving the paintings the character of tapestry (Dwa Cyprysy / Two Cypresses, 1911), or enlivening with sunlight (Widok z Okna – Anticoli Corrado / View from the Window – Anticoli Corrado, 1905). Influenced by Japanese aesthetics, he introduced ‘grating‘ to his compositions – a web of branches and boughs of trees situated in the foreground, taken from oriental woodcuts, through which a fragment of the landscape is visible (Autumn Leaves, 1912; Orange Tree, 1913). He also used a frog’s perspective to show a river landscape from under a bridge (Landscape with Waterfall and Castle, 1900), and the tree trunks brought to the foreground contrasted with the surface of the sea (The Breadfruit in Amalfi, 1921). The impressively captured atmosphere of the warm south is perfectly in line with Okuń's decorations and synthetic treatment of forms (Southern Landscape, 1930). During his first years in Italy, he created symbolic works of literary interpretation, referring to mythology and legends, and at the same time being luminous studies with a rich texture obtained by short brush strokes and fine impasto (Driada, a Forest Nymph, 1902). The greatest part of Okuń’s artistic heritage is his portraits. 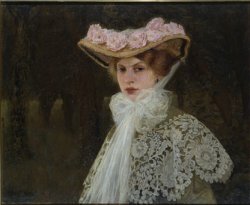 In addition to the representative salon portraits (Dama w Sukni Pąsowej, 1908) and historical costume portraits (Portret Fantazyjny, 1911), the artist regularly painted female heads evoking a fairy-tale aura (Głowa Rzymianki, 1906; Beatrice, Fulvia, and Rosa, all from 1911); These paintings were in the sphere of imagination rather than in the portrait convention, which reliably reproduces the physiognomic features of the models (Portret Na Tle Cyprysów, Portrait with Cypresses, 1911). The figure of a mysterious, charming, and seductive, and sometimes demonic woman, became, as in the iconography of European symbolism, a recurring theme in Okuń's work (Herodiada, Salome, 1902; Pawica / Peacock, 1905; Jaszczurka / Lizard, 1906). In the drawings, the etherealness of the melting spots of watercolours, their transparency and mutual penetration evoked the impression of a woman’s face recalled from memory. The dimension of fantasy was intertwined here with the musical rhythms permeating both the human soul and nature, rhythms dotted with the wavy vista of the band of hair that penetrates into the sphere of the landscape. This kind of plastic equivalent of the modernist concept of panpsychism – the idea of the inseparable spiritual unity of the element and matter – was created by Okuń in his vignettes in the Art Nouveau style featured in Chimera magazine. Imaginary princesses and princes in richly decorated costumes also appeared in Okuń's pictures and paintings: Królewna w Sadzie (Princess in the Orchard, before 1911), Czarna Dama (Black Lady), Czarny Rycerz (Black Knight, 1911); Walka Dobra i Zła ( Battle Between Good and Evil ); Zwycięzca (Winner , 1910) – a fairy-tale-like motif characteristic for the iconography of German symbolists focused around the magazine Jugend, for which Okuń created a number of illustrations. The phantasmagoric dimension is visible in the symbolic composition of My i Wojna (Us and the War, 1923), in which the decor of the garment and background is perfectly matched with the veristic treatment of the physiological features of the artist's wife as well as his own. The abstract theme of modern music, which is characteristic of modernism, appears in the atmospheric compositions of the Cztery Struny Skrzypiec and Grajek (Filistrzy. Niewdzięczni Słuchacze) – 1904. Author: Irena Kossowska, Art Institute of the Polish Academy of Sciences, April 2003.